Happy almost Christmas! Is it just me, or do you also feel like it isn't December yet? I still can't wrap my head around the fact that it's already the second week in. December is usually a time that I sit back and look at the past year. Despite the many lows, I can truly say that this year has still been amazing. I have so much to be thankful for in life and I am super thankful for all the support I've received in this space! Just in the past few months I have met some incredible & beautiful souls who I can call my friends. One of these souls is Nancy of Fancynancista! 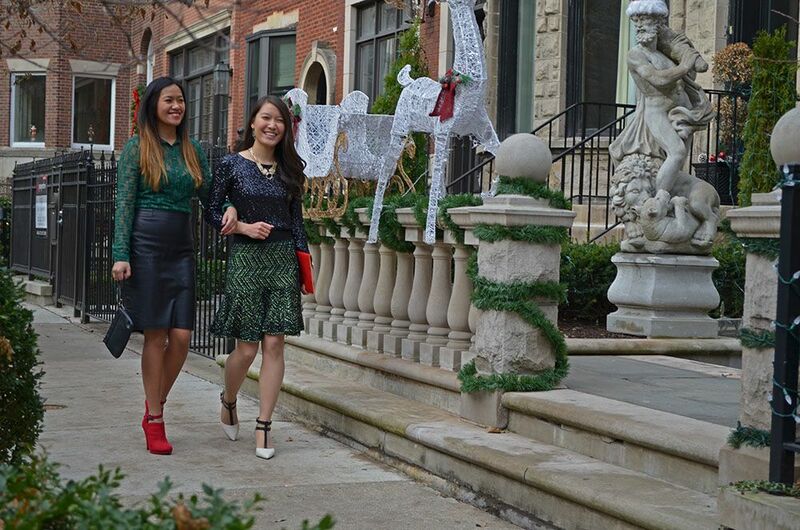 It's so fun how we instantly clicked the moment we met at a blogger event. Chicago bloggers are the best - I'm not biased or anything! 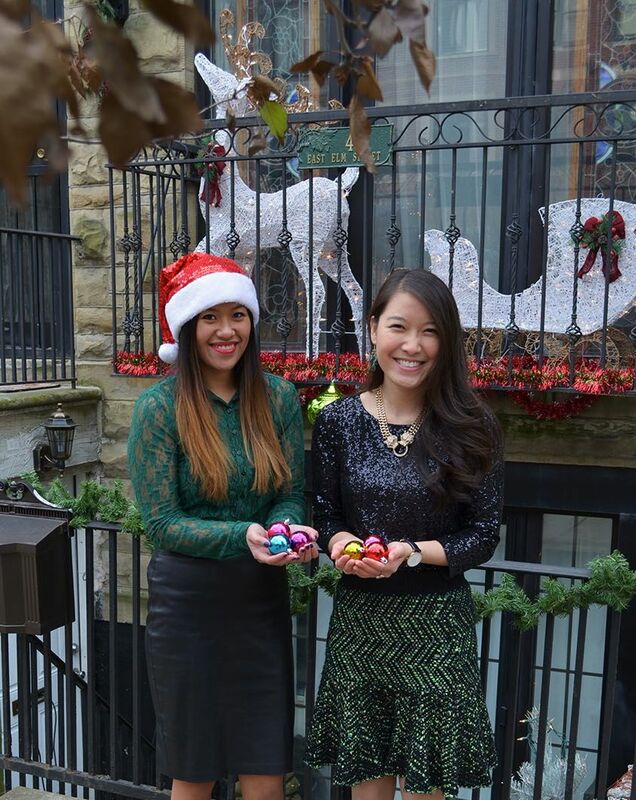 We decided to collaborate on this fun Christmas outfit shoot. And the best part was that when we showed each other the outfits we picked, they turned out to be color coordinated, but in reverse. 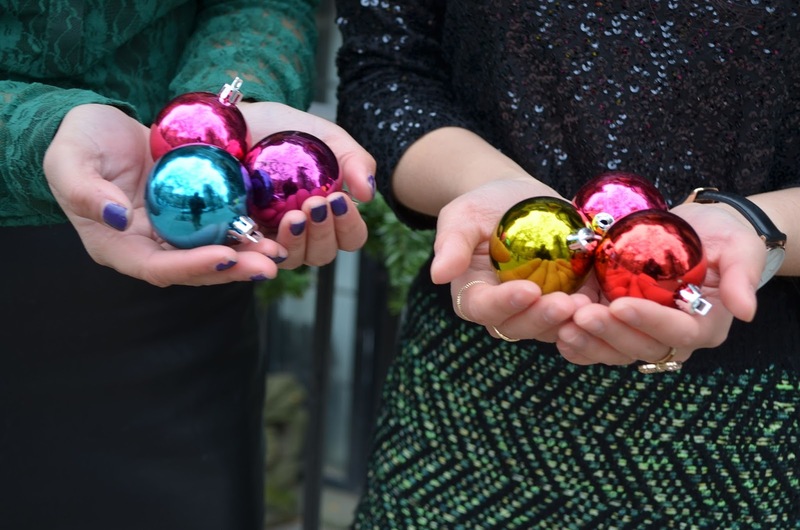 We hope you love these looks & get some inspiration for your next Christmas party! I decided to wear my new Anthropologie swing knit skirt that I scored for an extra 30% off sale! It just sold out online, but here's a similar Anthropologie skirt that I also love. 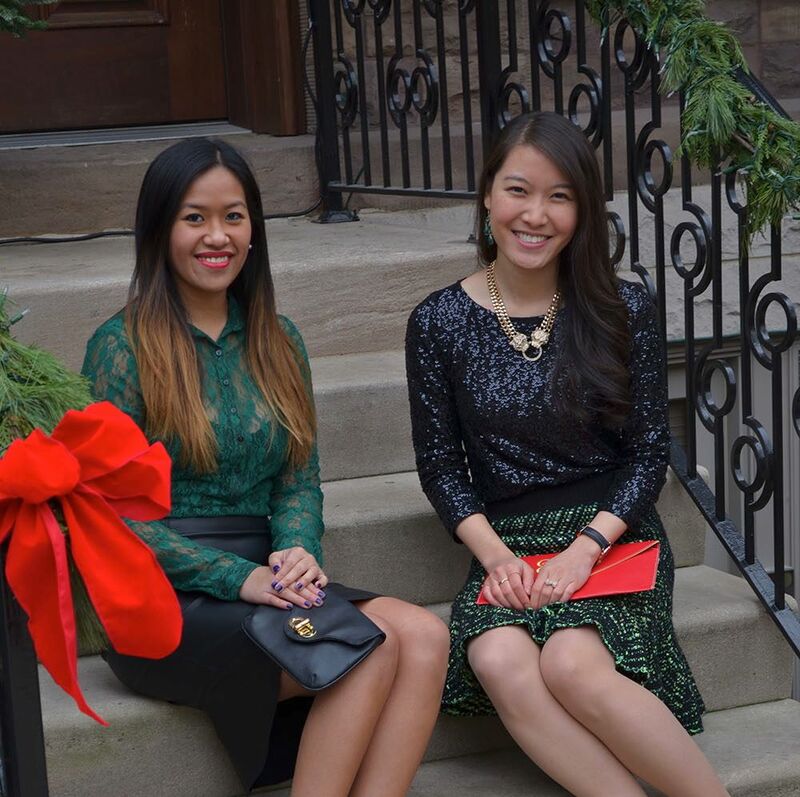 For some sparkle for the Holidays, I wore a JCrew sequin top and added gold accessories to finish this festive look. 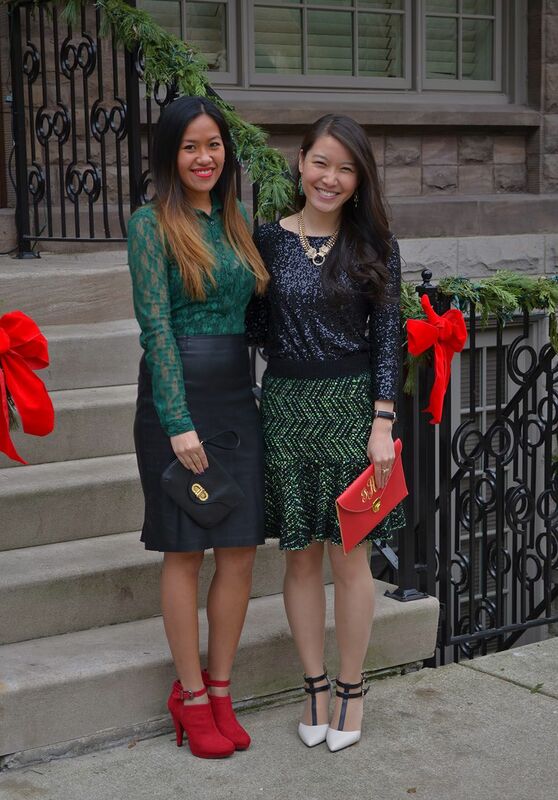 I used my favorite Benevolent Jewels clutch to add extra color to my look. When doing some Christmas shopping at Benevolent Jewels, don't forget to use code "JHCODE20" to get 20% OFF your purchase!! Love you guys! Keep living and loving big! This world needs a whole lot more love especially when the Holidays are around the corner! Love you and love this!! Can't wait for our future collabs!! You look lovely in sequin, milady. I love your heels, too. I love both your outfits. I like how you've colour co-ordinated them plus the outdoor decorations. Great fashion minds think alike. 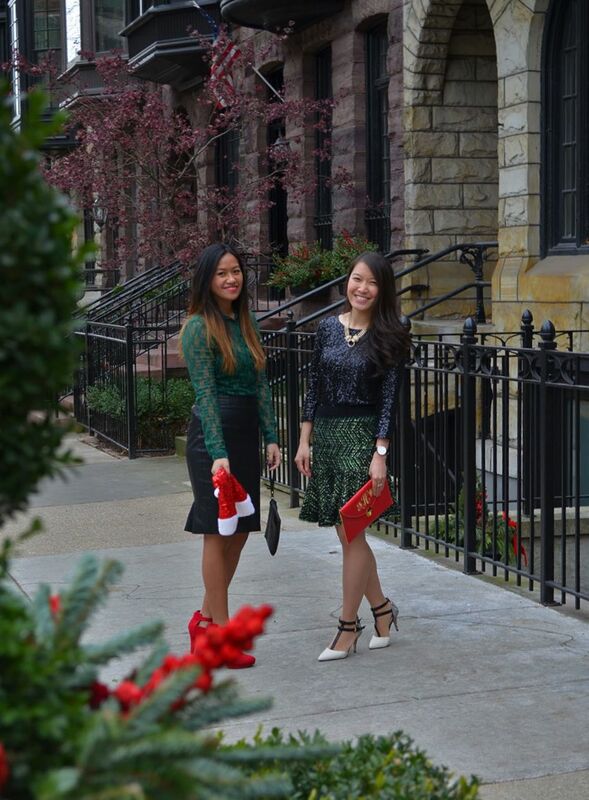 Love both of your outfits and so fun for the holidays. wow I love the bright beautiful colors. You guys are so gorgeous! These outfits look so nice. I really like the white and black heels.